Background graphic: ESA/ATG Medialab; inset: J. Dorelli (NASA). What’s new under the Sun? The ESA Cluster Project – a series of four satellites – have been busy studying the solar wind. That mysterious energy that pushes outward from the Sun. By using their combined data as a sort of “space plasma microscope”, researchers are capturing the most minute details ever revealed. What have they found? Try minuscule swirls which may hold the answer to how the Sun passes on heat. Inside these swirls is natural turbulence – a complex condition which plays a major role in everything from moving water to moving air. It is present in experimental fusion reactors on Earth and turbulence is also present in space. The Sun emits streams of charged particles known as the solar wind. According to scientists, turbulence could be a factor in maintaining the heat of this wind as it escapes the Sun’s surface and travels throughout the Solar System. As the solar wind races away, it does cool down – but not nearly as much as it would if the flow were smooth. What causes this solar turbulence? It comes from small “irregularities in the flow of particles and magnetic field lines”. However, it isn’t quite that easy. The energy occurs everywhere – from a grand scale when it leaves the Sun, down to a smaller scale where it becomes distributed. This action is much like trying to follow a river from its point of origin – where it flows smoothly along – to the end of a waterfall where small pockets of turbulence form at the bottom. In this new study, two Cluster satellites have made very detailed observations of plasma turbulence in the solar wind – a study which kept the satellites on 20 km apart along the direction of the plasma flow and taking 450 readings per second. These results were then compared to computer simulations and scientist verified the presence of sheets of electric current measuring 20 km across and positioned along the edges of the turbulent pockets. “This shows for the first time that the solar wind plasma is extremely structured at this high resolution,” says Silvia Perri of the Universita della Calabria, Italy, and lead author of the paper reporting the result. However, this isn’t the first time that the Cluster project has been watching the Sun. 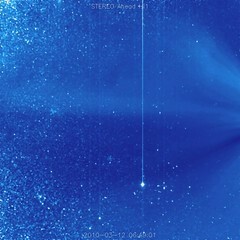 Before the current study, the spacecraft observed 100 km sheets located in the magnetosheath, the area between our magnetosphere and the bowshock created by the incoming solar wind. At the edge of this turbulent area, the process of “magnetic reconnection” is occurring – magnetic field lines with opposite poles separated and reconnect with other close field lines and release energy. “Although we haven’t yet detected reconnection occurring at these new, smaller scales, it is clear that we are seeing a cascade of energy which may contribute to the overall heating of the solar wind,” said Dr Perri. According to the news release, future missions such as ESA’s Solar Orbiter and NASA’s Solar Probe Plus will be able to determine whether similar processes are also in play closer to the Sun, while NASA’s Magnetospheric Multiscale mission will specifically probe the small-scale regions where reconnection can occur. Original Story Source: ESA Space Science News Release. Reported by Tammy Plotner for “Dave Reneke’s World of Space and Astronomy New”. Leaks Found in Earth’s Protective Shield.